Laurelton Community Library Manager Dave Wang (in his yellow Everyone shirt) enjoys a program with his customers. We’ve reached the three-month mark of the Queens Library is for Everyone campaign, and our librarians and employees continue to visit neighborhood businesses and schools, demonstrate the inclusive nature of our libraries, and take extra steps to provide a warm and enthusiastic welcome to our visitors. At Laurelton Community Library, manager Dave Wang and his staff take every opportunity to promote the Everyone campaign, such as before popular programs. “All staff members work as a team to make the message clear for our customers that Queens Library welcomes everyone,” says Dave. 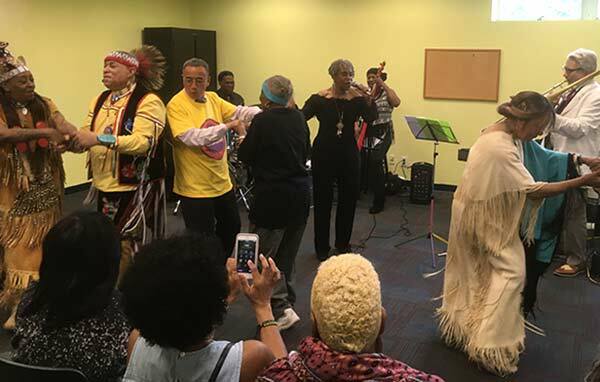 This includes programs like the recent celebration of Native American jazz artists Russell "Big Chief" Moore and Jim Pepper on June 10, which introduced the music of these two legends to visitors who may have never heard of them. “Laurelton Library has worked hard to create many educational, cultural, and informational programs that engage our library with our community,” Dave observed. "Our customers have constantly told us that they can tell that our library serves everyone from the various programs we offer." Woodhaven librarian Linda Czerwinski with members of their gardening club. At Woodhaven Community Library, staff members Manjula Budhraja, Linda Czerwinski, and Kendra Kuszai work together to involve our customers in caring for the library’s garden. 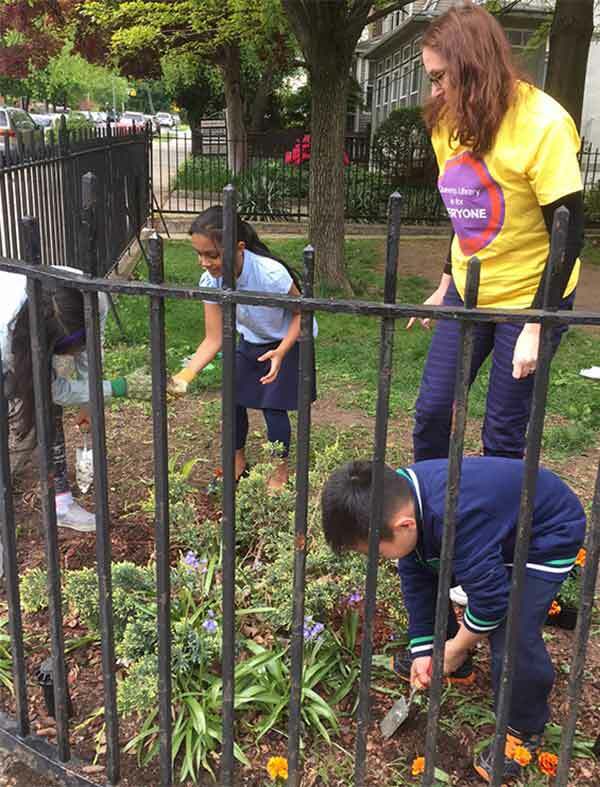 Every other Wednesday, Woodhaven holds a gardening club where they welcome children and adults in the community to plant and help maintain tomatoes, cucumbers, spinach, kale, peppers, eggplants, herbs, and flowers in the garden. In recent weeks, children have been able to harvest from the garden, make salads, and even take some vegetables home with them. The NYC Compost Project also visits the garden at Woodhaven to teach customers about keeping soil healthy and composting. Stay tuned for future stories from our library staff, and sign up for email updates on the Everyone campaign.